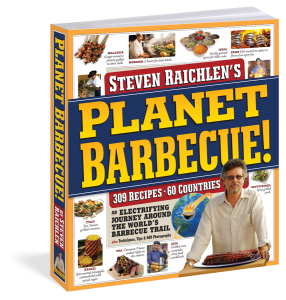 The most ambitious book yet by America’s bestselling, award-winning grill expert whose Barbecue! Bible books have over 4 million copies in print. Setting out—again—on the barbecue trail four years ago, Steven Raichlen visited 60 countries—yes, 60 countries—and collected 309 of the tastiest, most tantalizing, easy-to-make, and guaranteed-to-wow recipes from every corner of the globe. In addition to the recipes the book showcases inventive ways to use the grill: Australia’s Lamb on a Shovel, Bogota’s Lomo al Trapo (Salt-Crusted Beef Tenderloin Grilled in Cloth), and from the Charantes region of France, Eclade de Moules—Mussels Grilled on Pine Needles. Do try this at home. What a planet—what a book.